Widening your had position will increase the strain on your outer chest while a normal pushup will target the inner chest and triceps. Pushups are an essential workout from the average guy to the most extreme bodybuilder. 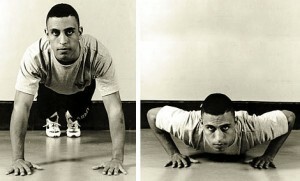 Pushups can be used to supplement a regular routine of benchpress which will help break the plateau effect that bodybuilders often experience. If you go to the gym and cant seem to get in the groove of lifting like you usually do then do some pushups to break up your workout routine. The guys in the movie 300 didn’t get massively ripped by doing the same bench-press routine every week. Switch it up and see some results! This entry was posted in Chest, Fitness, Pushups and tagged chest, inner chest, plateau, pushups, Triceps by Russell Jensen. Bookmark the permalink.